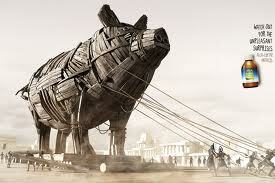 The story of the Trojan Horse has been passed down for centuries and become the subject of plays, and movies. The value of Greek Myths in education as a tool for understanding cultures and for building an understanding of history can’t be measured. The Horse figure is a strong attraction, leading to interest in the study of the war and the people of Troy and Greece. 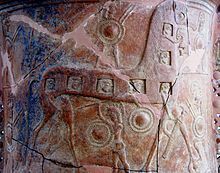 The use of such an imaginative tool in war and the artistic quality of the horse and its many representations in art since then helps develop a cross over in curriculum from history to art. Adding a storytelling or play to the process brings other avenues of learning into use as the language, new vocabulary and creation broadens the skill range and taps learning through auditory , tactile and visual stimuli. 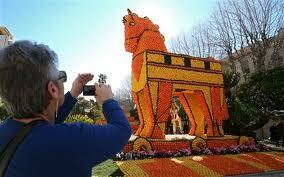 The story of the Trojan Horse is so universal, the symbol of the horse is easily recognized in many different forms. Here at the Lemon Festival it has been captured in a citrus rendition. Surprisingly enough even changed in form we recognize the Trojan Horse as in this ad.